Referendums are odd beasts in the menagerie of democracy. On the one hand, they can see seen as one of the purest forms of democratic participation, giving every voter a direct say on a matter of importance. On the other, they force debate into a very simplified binary outcome, ‘yes’ or ‘no’ to a question of often huge complexity. And so it is with the referendum on British membership of the European Union (EU), due to be held by the end of 2017, but currently on track for June of this year. Behind peoples’ choices about whether to Remain or Leave there stands a vast array of interests, beliefs and dispositions. At the same time, we know that levels of knowledge in the British public are relatively low, as is the degree of importance than is placed on European integration as an issue. 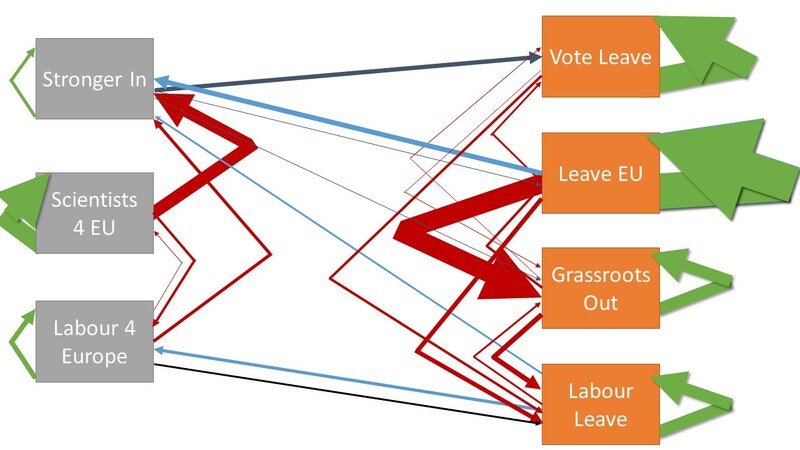 All of which places the referendum campaign groups in a central position. They will be pivotal in setting the terms on which the referendum is debated, and in providing the information on which people base their decisions. Since David Cameron confirmed that he would not force his MPs to hold the same line as the government, it has been clear that this will not be a party political contest – although parties will be involved – but one fought between ad-hoc constellations of campaigners, who might more normally be found on the opposite sides of political debate. In this post, and the weekly posts that will follow, we want to help you understand what these groups talk about and why they talk about it. In so doing, this will cast some more light on the issues in hand and the factors that shape them. We have no agenda in terms of how you should vote, but we do care that you should be able to make as informed a choice as possible. As this is our first summary, it’s useful to set out what we do, and what we don’t, aim to achieve. We will looking at all those groups that are actively campaigning in the EU referendum. This means not only the groups that eventually become the officially-designated Remain and Leave groups (something that will only happen when a referendum date is finally set), but also all the other groups that have as their primary purpose the fighting of this referendum. That means we’ll not look at political parties, who have other business in hand, but we will try to capture as many of the smaller, more specialised groups that exist or are being set up. You can find a list of who we’re tracking here: we’ll be constantly reviewing this as we go. In terms of what we look at, we’ll be focusing on the documents that the groups produce, as well as their social media channels. These represent a good reflection of what the groups think is important and of they way they chose to present their information, not to mention a key way that the public will see what the groups are arguing. The nature of the referendum means that this is effectively an ‘revealed preference’, a demonstration of what any given group thinks is the best way to convince people of their argument: since the groups largely only exist to win the referendum, whether they believe what they say is almost to one side. We note this paradox, if only because it demonstrates the somewhat perverse incentives in a referendum, to win at almost any price, even if that has very negative long-term consequences. We do not, however, aim to pronounce on the accuracy or otherwise of the groups’ materials: for an informed and balanced effort to go that, we would recommend the ESRC’s ‘UK in a changing Europe‘ initiative (in which Simon is a Senior Fellow) or Hugo Dixon’s InFacts. While we might note when groups challenge each other, we leave it to the reader to decide who they find more convincing or credible. Likewise, will not suggest that we will capture the entirety of the referendum debate. While the groups are very important, they will not be the sole participants: witness the stream of pronouncements from businesses, parties and pressure groups, all of whom consider the issue to be one in which they have a stake. Likewise, we do not aim to take account of how the media process and re-presents groups’ materials: while TV coverage is and will be relatively balanced, through legal obligation, the print press will pursue their various interests and agendas with vigour, as this week has very vividly demonstrated. Finally, it is important to note that we are not looking at everything that the groups do. This is particularly important when looking at those more focused on face-to-face activities, such as Grassroots Out, but it also holds for others. We might expect that social media, in particular, will be tailored to the audiences most likely to use them: younger, relatively well off and more educated. However, social media remains a key channel for engaging audiences, without media getting in the way, and we will be comparing how those messages compare with their other documents. So with all of these caveats and cautions in place, let’s take a first look at what we have, to get a sense of the status of the debate as we move into what well be the final negotiations between Cameron and the European Council. Below are word clouds for all the groups’ Twitter feeds over the past week, plus one each for the three main campaigning groups: Britain Stronger in Europe (Remain), Vote Leave and Leave.EU (both Leave). The bigger the word, the more frequently it is used. All campaigns (@vote_leave, @LeaveEUOfficial, @StrongerIn, @labourleave, @Scientists4EU, @labour4europe and @Grassroots_Out). Wordle generated using NVivo from user tweets extracted using Python, 28/2 to 3/2/2016. 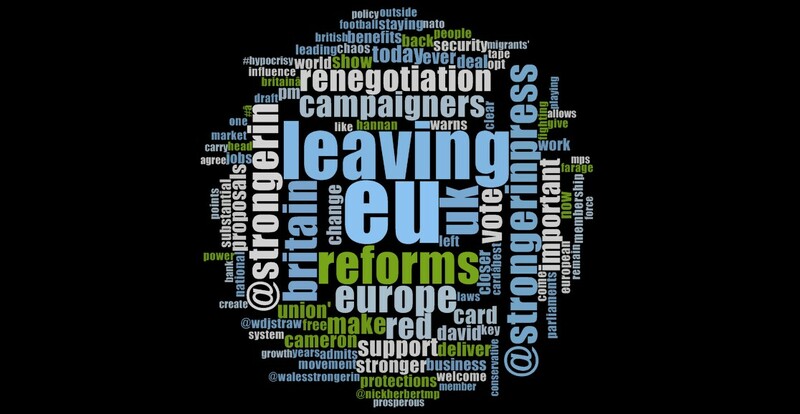 @StrongerIn Wordle generated using NVivo from user tweets extracted using Python, 28/2 to 3/2/2016. @vote_leave Wordle generated using NVivo from user tweets extracted using Python, 28/2 to 3/2/2016. 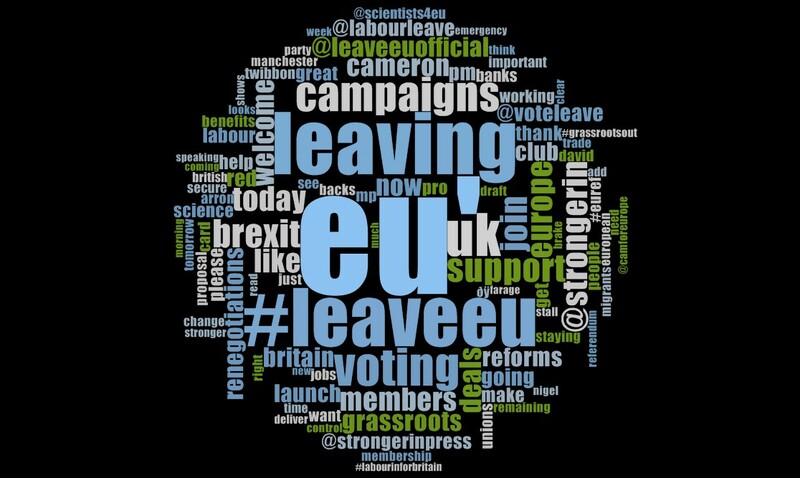 @LeaveEUOfficial Wordle generated using NVivo from user tweets extracted using Python, 28/2 to 3/2/2016. Perhaps the most striking feature is that all three clouds look very similar. In particular, all of them use the word ‘leave’ a lot, largely because StrongerIn has devoted considerable energy to challenging Vote Leave on its claims and its competence. Also of note is the use of the words ‘Europe’ and ‘EU’: StrongerIn appears to be much more comfortable talking about the former, while the Leave groups prefer the latter. In both cases, this seems to be based on assumptions about the feelings attached to each work. StrongerIn attach ‘Europe’ to ‘reform’ , ‘renegotiation’ and change’, while the Leavers often leave the ‘EU’ as simply a free-standing bad thing to be got out of. Whether such assumptions stand up to scrutiny is another matter. Interestingly, the interactions between the different groups (as illustrated in the diagram bel0w) shows how the social media discussion about group rivalries plays out: again, thickness of lines is proportionate to volume of tweets. If we take direct mentions of other accounts, we can see that the two camps primarily talk to themselves, rather than each other. StrongerIn is clearly dominant on the Remain side, drawing in interest, rather than pushing it out. The picture is more mixed for Leavers, with Labour Leave gathering most interest this week, albeit dwarfed by the large volume from Leave.EU to Grassroots Out, groups that have much in common. Further complicating the issue is the mentioning of one’s own group, mainly through retweeting of other accounts’ postings. As Laura Cram has noted in her excellent piece on hashtags, the Leave campaign seems to be well ahead in generating volume and profile online. @ mentions of EU campaigns. Analysis of tweets from the 28/2 to 3/2/2016. Grey = ‘in’ to ‘out’; Blue = ‘out’ to ‘in’; Green = to own campaign; Red = ‘in’ to ‘in’, or ‘out’ to ‘out’. As we can see from this first cut, the different groups are still in a phase of development. It has only been in the past couple of days that the shape of the renegotiation package has become clearer, so we will be looking to see whether and how this changes the messages that the groups still to communicate. At the same time, it is evident that the groups will challenge each other and will seek to make as much of emotional plays as of rational calculations. As we move towards the European Council in a fortnight, how the groups handle this might well set the tone for the rest of the campaign.